The last time the Poppies travelled up to Lancashire for a game of footy it was on a Tuesday night, it was also the 13th of the month, and it was in March 2012. In one of our worst seasons ever we scraped a goalless draw at Southport. Before that it was yet another Tuesday night up at Fleetwood in November 2011. Some bloke called Vardy was on the bench, he wasn’t good enough to face the mighty reds. What it is with Lancashire on Tuesday nights? The PRATS were travelling up on the team coach, well almost all of us; Parker was still swanning around in Spain looking for a wicker donkey called Oatey wearing a sombrero. We picked up Pharp along with a few other relatively unimportant folk at Corley Services and so the long drive up the M6 continued. With the temperature forecast to drop into single figures by 9:00pm I thought I’d better dig out the vest, the big coat and of course my hand knitted Poppies scarf. Mrs Fuggles spotted the scarf and that was it, “don’t you lose that scarf, it took me months to knit that, you lost the last one; it took me months to knit that one as well”. On and on this annual recital goes on and on, I lost count of how many times I said “yes dear”. I shaped the scarf into a garrotte during this period of numbness, and undid it quickly when she turned around, “yes dear”. It was around 6:00pm when we finally arrived at the ground; fortunately Rasputin had arrived before us and was advising the Bamber Bridge staff where to park the bus. Hopefully the mad monk was also the chief advisor to the team on bus parking techniques. Actually it’s not Rasputin, its Topper with a full facial hair down to his knees, still mad though. Pharp, Citra and Fuggles started the 12 minute (verified by Googlemaps UK) route march to the Withy Arms. Entering by the rear smoking veranda, we were greeted by a smart pub with a nice row of hand pumps serving micro-brewery ales. Several Poppies supporters were already in there enjoying the ales. On tap was two ales with WA on the pump clip, Best bitter brewed by Ribble brewery which is owned by the same people that own the Withy chain of pubs all based locally, and their own ale WA. But we’re not sure if these are not the same ale, the young girl behind the bar said they were. The Whatpub website suggests that the house ale is brewed by Thwaites and comes in at 3.2% whereas both of those on offer where 3.6%. Even the chalk board above the bar suggested the ales were different. Either way only the Best Bitter was available. 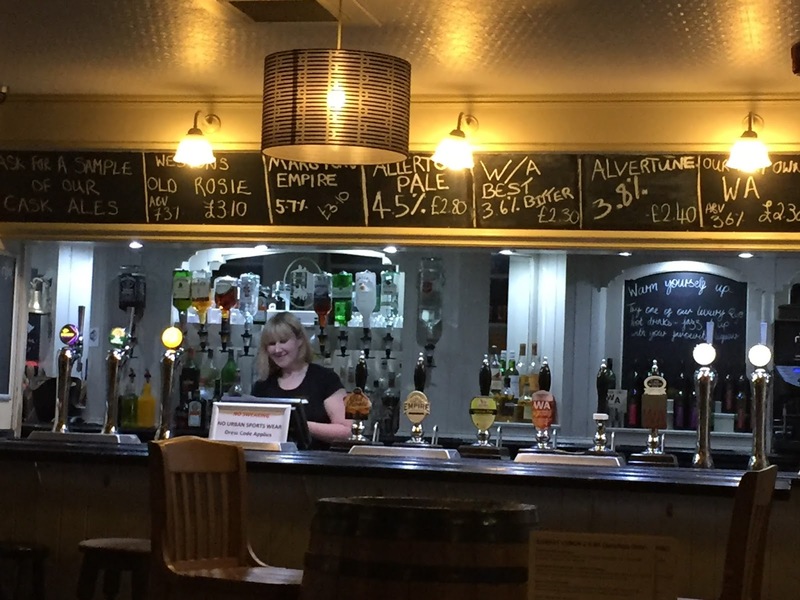 There were two ales from Wall’s brewing Co of Nothalllerton, Alventure at 3.8% and Allerton Pale, at 4.5% plus the very robust 5.7% abv Marston’s Empire, with the 6th pump serving Old Rosie Scrumpy cider. Pharp went for the WA Best Bitter, copper coloured ale looked very clear with a good head clinging to the glass. £2.30 a pint is a good price to pay for ale these days. Citra and I went for Wall’s Alventure, once again in good condition, pale and tasty with a good head. We had the last 2 pints as it went off directly after we were served, considering this; the ale was in good nick. It was replaced by Prospect Brewery’s Pioneer. By this time both Marshall and Petit Chemise had arrived, as expected Marshall went for the Pioneer, nice looking chestnut ale, very clear coming in at 4.0%. More beer, Pharp stayed with the house beer, whilst Citra and I went for the other Wall’s ale Allerton. A lovely earthy bitter, as before in very good condition. Citra proclaimed that if he lived in Bamber Bridge, he would be happy to make the Withy Arms his regular imbibing haunt. All the prices were very good, even the selection of lagers looked impressive, Peroni, Warstiener and Estella to name just a few. 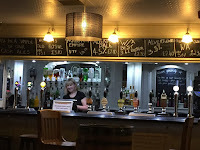 A very good pub, the menu looked well balanced and once again very well priced. It was time to trudge back to the ground; we decided to give the clubhouse a miss until after the game. The game, well for fear of becoming repetitive, it was a Tuesday night, we were away, we lost again. Despite playing well for most parts of the game we once again come away empty handed. It was a classic cup tie, end to end stuff, goal mouth clearances all the ingredients required for an entertaining game for the neutral and nerve jangling stuff for both sets of supporters. Well done Bamber Bridge, hopefully the additional 200 onlookers more than their usual gate will attend again during the season. Best of luck in the next round down in the south of our county. So onto the clubhouse, what a delight, 2 hand pumps. Bradfields Farmers Pale Ale and Bank Top’s Barley To Beer. Pharp went for the latter thinking it was a dark beer, it wasn’t it was a delightfully light coloured ale coming in at 3.6%. Unfortunately the beers were served in thin plastic squeezy glasses. Nevertheless the ale was in excellent condition, it’s a job to tell if it was pristine as the plastic glass is not clear itself and the head never really clings to the side. Fuggles and Citra went for the more robust Farmers Pale Ale coming in at 5.0%. This was lovely, full bodied with a delightful dry after taste. The ale looked as clear as we could tell, with a reasonable head. Nice newish looking clubhouse with plenty of space. In fact the whole ground looked fairly new, clearly some good investment has been made here. That was it for the night at 10:20pm it was back onto the coach for the long journey home. On the way back looking through the window the night sky was incredibly clear once we’d got away from the motorway lighting. I commented that I couldn’t remember seeing so many stars when I was a kid. Up chirped Citra, “there weren’t, but they have better telescopes now and they have discovered a lot more”.…….Stunned! As John McEnroe once said, “you cannot be Sirius”. Next week it’s Biggleswade, on a bloody Tuesday night.